Fiona, a precocious 16-year old with dreams of rock and roll stardom, has become the “special friend” of Schwartzey, a powerful music producer with a penchant for teenage girls who promises to make her dreams come true. Fiona and Schwartzey party in the back of a limo on the way to dinner at the hottest club in New York City. Once they arrive, they are joined with the elite of the downtown art and music scene. At Schwartzey’s special table are his celebrity friends, Jane Alberta James, a Vogue cover model, her new mysterious husband from Mozambique, and Rupert, an international rock star. The scene, as viewed through Fiona’s eyes, is surreal. Glimpses of a white rabbit hopping through the club along with a disturbing encounter with one of Schwartzey’s ex-lovers serve to illuminate the danger hidden by the glamour of this world. Will Fiona succumb to Schwartzey’s seductions or find her way out with her innocence intact is the question at the center of this dark comedy. Penny Jackson is a proud member of NYWIFT and thrilled to be collaborating with fellow member Melissa Skirboll on My Dinner With Schwartzey as co-writer and producer. Although a playwright and a novelist, Penny is very excited about venturing into the film world. Her novel, Becoming The Butlers, (NYPL Best Novel of the Year) was optioned by Warner Brothers. 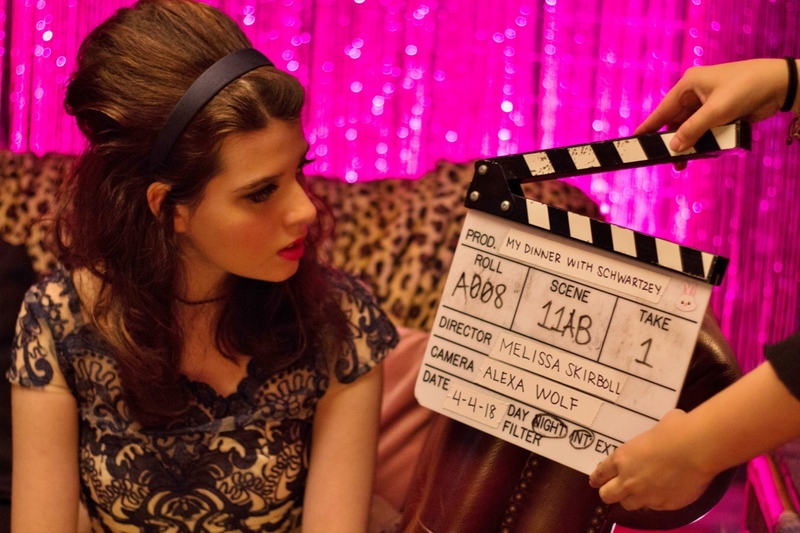 She is also the co-executive producer of BITE ME by fellow NYWIFT member Naomi McDougall Jones and Joanne Zippel. Jackson has won many award for her writing including a Mirrielees Fellowship in Creative Writing from Stanford University, the Elizabeth Janeay Prize in Creative Writing from Barnard College, a Pushcart Prize for best short story of the year and a writing fellowship from The MacDowell Colony. Her books include Becoming The Butlers and a collection of prize-winning short stories, L.A. Child and other stories, which My Dinner With Schwartzey was one of the featured stories. Her plays have been produced in New York, Chicago, Los Angeles, and Minneapolis and abroad in Dublin and Edinburgh. Selected plays include I KNOW WHAT BOYS WANT, SAFE, LOUISE IN CHARLESTOWN and PHOENIX. Her play, I KNOW WHAT BOYS WANT, was the theater review site Theater Is Easy’s Best Bet for Off Broadway Theater. This play, produced by Ego Actus was also chosen as one of the best plays in an Off Broadway production theater by NYTHEATER.COM and was the best selling play in 2014 for Indie Theater Now. SAFE, which won best new play at the Planet Connections Theater Festivity in New York City and was later produced at 59E59, The Edinburgh Fringe in 2014 and a new production at The !4th Street Y theater in 2016. Applause Theatre recently chose Jackson’s play BEFORE as one of the best American short plays in 2016. BEFORE won first prize in the gun control play competition sponsored by The University of Illinois-Urbana, and was featured in Necessary Exposure, an exhibit at Dixon Place Theater focusing on female playwrights. The play was also chosen to be in included in Playwrights For A Cause’s benefit at The Atlantic Theater Company against gun violence. MONLOGUES FOR THE THEATER published by Hal Leonard Performing Arts. Jackson is a proud member of The Dramatists Guild, New York Women in Film and Television, The League of Professional Theatre Women and The International Center of Women Playwrights. Melissa Skirboll is a proud member of NYWIFT and thrilled to be collaborating with Penny Jackson on My Dinner With Schwartzey as director and co-writer. Her first short film (writer/director) Show & Tell Tango premiered in September 2017 at the Västerås Film Festival in Sweden and subsequently has screened here in NY at The Greenwich Village Film Festival (10/17) and in NJ at The Brightside Tavern Short Film Fest (3/18). Skirboll is a presence in the indie theater scene where her work has been recognized with a number of nominations and awards: she’s won both the outstanding playwright award (for her play Blizzard: A Love Story) and outstanding direction (for her work on The Closet by Amy Gray Piper) at the Planet Connections Theatre Festivity, There, she has also been nominated for acting in Blizzard, for direction on Superstars by Glory Kadigan and Straight-Faced Lies by Mark Jason Williams, and for her projections/SFX on A Madness of One Acts. She previously worked with Jackson as director on her short play Bowery Street Blues (for which Jackson was nominated for outstanding playwright,) and on a staged reading Of My Dinner with Schwartzey in an evening of adapted pieces from Jackson’s L.A. Child and Other Storiesat Dixon Place. She is a proud member of New York Madness, a director for the Women’s Work Full length Play Lab at New Perspectives Theatre and has directed for various companies including Nylon Fusion Theater Co, Urban Stages, Abingdon Theatre and Estrogenius Festival. Ego Actus, Abingdon Theatre, and Urban Stages have staged her plays here in New York. With her producing company, LifeDream Productions, she produced the film Show & Tell Tango and the plays Hell is Where the Heart Is, (4 Nominations, 2 Wins), Blizzard: A Love Story, (6 Nominations, 2 Wins), and The Closet (5 nominations, 1 Win) at Planet Connections. Melissa also teaches acting for the Sande Shurin Acting Studio and works with individuals as a private coach.